The Resistible Rise of Arturo Ui was written by German Playwright Bertolt Brecht whilst he was in exile in Finland during World War Two. Having been exiled from the Third Reich for his extreme Marxist views, Brecht uses his experience of the corrupt state as influence for his play, which premier in 1958, two years after his death. Following a critically acclaimed revival at the Chichester Festival Theatre in 2012, The Resistible Rise of Arturo Ui transfers to the West End’s Duchess Theatre. 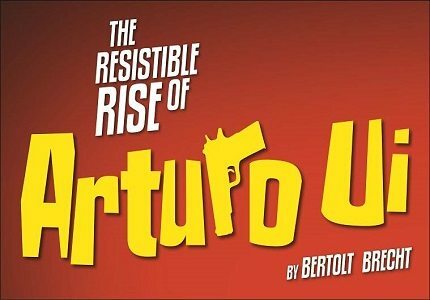 The Resistible Rise of Arturo Ui is an extremely satirical approach to the rise of Hitler in Nazi Germany, told allegorically through the rise of a vegetable tradesman. The central character, Arturo Ui, is a ruthless opportunist and is a direct parallel to Hitler, except instead of manipulating Prussian Junkers, he manipulates the Cauliflower Trust. Historical events such as the Reichstag Fire and the Anschluss, which were pivotal to the dictator’s rise to power, are also present in the play but are similarly disguised in the Green-Grocery allegory. Arturo Ui is one of Brecht’s “Epic” plays, meaning it is delivered in a heightened, melodramatic style and deals with the murderous evens playfully, in order to heighten the grotesque nature of the subject matter. The show is directed by Jonathan Church and Henry Goodman will reprise his award winning performance as Arturo Ui. Whilst all violence happens off stage, the subject matter of the show is quite dark and may not be suitable for younger children. Children over the age of 10 may find the show fun and educational.